BIS supremo Robert von Bahr is one of the recording industry’s more enterprising figures, combining so-called ‘core repertoire’ with contemporary works. 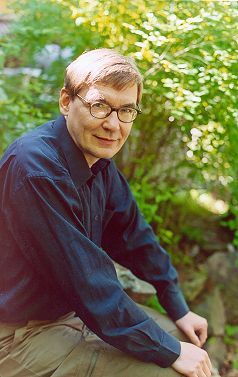 Among the latter is Finnish composer Kalevi Aho (b. 1949), most of whose output has been recorded by BIS over the past two decades or so. Few living composers are fortunate enough to have the solid backing of a single record label, not to mention the enthusiasm and support of conductors such as Osmo Vänskä and John Storgårds. This commitment and continuity ensures that Aho’s music is performed in the best possible artistic and technical environment, whether it’s the youthful First Symphony (1969) or the ambitious Twelfth (2002-03). Kalevi Aho was born in Forssa, south-western Finland, in 1949. His musical education began in earnest at the Sibelius Academy in Helsinki, where he was taught composition by Einojuhani Rautavaara (b. 1928), considered by many to be the greatest Finnish composer since Sibelius. Aho then went on to lecture in musicology at the University of Helsinki, becoming professor of composition at his alma mater in 1988. Four years later he was appointed the Lahti Symphony Orchestra’s composer-in-residence, and since 1993 has devoted himself to composition. Aho’s works and discography owe much to his longstanding relationship with the Lahti band and their artistic director at the time, Osmo Vänskä. Not only have the orchestra commissioned a number of his best works they have also provided a standard of performance that most composers can only dream of. Sadly Vänskä has since moved on to Minneapolis and, at the time of writing (September 2008) has decided to relinquish his position with the Lahti orchestra. That said the premiere and subsequent recording of Aho’s Twelfth Symphony suggests John Storgårds will be as strong an advocate of this composer’s music as any. In the concertos Aho is lucky enough to have some exceptional soloists, among them Christian Lindberg (trombone), Sharon Bezaly (flute), Gary Hoffman (cello), Lewis Lipnick (contrabassoon) and Martin Fröst (clarinet). Throw in the BIS recording team and some good venues – Lahti’s Ristinkirkko and Sibelius Hall – and you have the makings of a memorable cycle. And there’s more to come, with von Bahr committed to recording the rest of Aho’s works, most notably the Fifth and Sixth Symphonies. Receptive listeners should find much to enjoy here. Most established genres are represented – symphonies, concertos, songs for orchestra and chamber works – all of which highlight the consistency and strength of Aho’s musical imagination. This composer seldom fails to engage and hold one’s attention, especially in the symphonies, where he has a good grasp of the long span and an uncanny instinct for instrumental colours. But most of all one warms to the freshness and spontaneity of these works. Note: This survey covers the bulk of Aho’s output, as recorded by BIS. Future releases and discs that also contain the works of others will be reviewed individually on MusicWeb’s main site – see the Additional reviews section at the end of this article. Links to reviews by other contributors are included. Given Sibelius’s reputation as one of the great symphonists of the last century, contemporary Finnish composers may be forgiven for feeling a little overshadowed. Fortunately for the young Aho, Rautavaara’s advice and support proved decisive in shaping this symphony, which began life as a string quartet. The work is in four movements, the mysterious opening and ascending brass figures of the Andante strongly reminiscent of Shostakovich. Indeed, this is confirmed by the noted music publisher Fennica Gehrman, in a short article on the Finnish Musical Information Centre website. There is no obvious programme here, but in his refreshingly unpretentious liner-notes – a welcome feature of this entire cycle – Aho does speak of ‘nightmares’ and ‘psychological crises’. Even without these pointers the Andante has a certain bleakness – desolation, even – although there’s none of the trenchancy one associates with Shostakovich in similar mood. That said the grim little waltz in the Allegretto could so easily be attributed to DSCH, not to mention the quiet but insistent tread in the lower strings. By contrast the Presto kicks off with an arresting moto perpetuo that drives this fugue like a musical dynamo. This movement has some of the most individual writing so far. That said the shade of Shostakovich hovers nearby, the laconic waltz tune and a splintered remnant of the opening theme bringing the symphony to an enigmatic close. The other works on this disc – Hiljaisuus (Silence) and the Violin Concerto – date from the early 1980s. 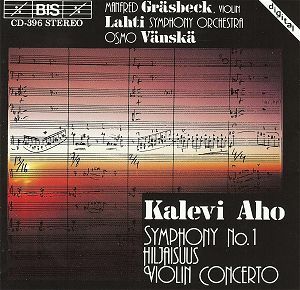 According to Aho, Hiljaisuus, a Finnish Radio commission that was to last no more than five minutes, was intended as an introduction to the recently completed Violin Concerto. It’s a strange swirl of a piece, a mix of unsettling glissandos and unearthly sonorities. Sample the short passage at 4:02 and you may be forgiven for thinking you’re listening to Ligeti. The Violin Concerto has more momentum and contrast than Hiljaisuus, although it shares the latter’s concentrated, more dissonant idiom. It isn’t the most grateful start to a violin concerto, the solo part – sensitively played by Manfred Gräsbeck – rather less prominent than one might expect. That said it would be difficult to hear it above the orchestral eruptions that punctuate the first movement. At 8:30 the soloist is given some insistent phrases that rise above muted timps, culminating in an equally restrained close. The repeated phrases at the start of the second movement – marked Leggiero – lead into music that fluctuates between light and shade. The soloist has some rhapsodic passages all to himself before we plunge into the spectral waltz of the finale. La Valse this isn’t, but the wild, somewhat demonic element is certainly present. Gräsbeck phrases these tunes like a Mahlerian Ländler – listen to the passage beginning at 3:37 – before he is crushed by a massive orchestral climax worthy of Bartók in Miraculous Mandarin mode. Whatever hints there may be of other sound worlds Aho has fashioned something altogether individual here, combining a range of ear-pricking sonorities with music of considerable punch and power. Nothing quite prepares one for the gentle, introspective close to this concerto which, as I have discovered, is something of an Aho trademark. Despite its obvious influences the symphony is remarkably assured for a student work. It’s economically scored, light on its feet and direct in its appeal, the chamber-like qualities much enhanced by the airy recording. The concerto is more roughly hewn; it’s a protracted tussle between soloist and orchestra, yet it has real presence and power. All credit to the Lahti Symphony Orchestra – just 40 years old when this recording was made – who play these scores with commitment and care. An excellent entrée to Aho’s distinctive sound world. The Second Symphony is also a youthful work – the composer was just 21 at the time – but it differs from the First in that it’s cast in a single movement. After the premiere in 1973 Aho decided to rework the middle section, a task he didn’t attempt until 1995. The result is a compact, tightly structured piece – it’s a triple fugue – which the composer candidly admits was intended as an antidote to some of the more ‘difficult’ music of the 1960s. As with the fugues in the First Symphony there’s no hint of dutifully reconstructed baroquerie or dry didacticism; instead, Aho uses fugues to create a remarkably dramatic and cohesive symphonic whole. And despite the echoes of Shostakovich in the First Symphony it would be wrong to think of Aho’s early musical style as ‘Shostakovich-lite’. Yes, DSCH could be the model for the brooding theme that ushers in the Second Symphony but there is enough in this unfolding music to suggest the composer is finding his own ‘voice’. Just listen to that extraordinary sustained passage that begins at 10:03, where we enter a more individual, more rarefied soundscape altogether. There is a pleasing directness to Aho’s musical utterances that will appeal to those who find much late-20th-century music too dry or relentless. Even though this symphony may only last 20 minutes there is much to discover and enjoy here. As always Vänskä and his Lahti band – the mainstays of this cycle – are very well recorded, especially in the symphony’s final, more spectral, moments. 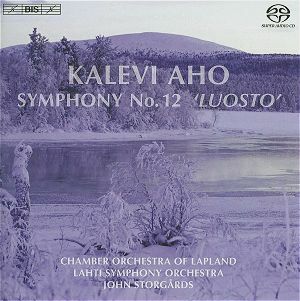 This well-filled disc also offers a splendid performance of Aho’s Seventh Symphony, penned after the composer took a break to concentrate on his concertos and other works. The intriguing subtitle, ‘Insect Symphony’, is derived from the composer’s opera Insect Life, which he entered for a Savonlinna Opera Festival competition in 1988. The work was rejected at the time, so rather than abandon it altogether Aho decided to recast it as a symphony. Incidentally, Savonlinna’s loss was Helsinki’s gain, as Insect Life was given a triumphant premiere by Finnish National Opera in 1996. The result is a set of six pieces that contain conventional musical forms, including a foxtrot, tango, marches and lullaby. The first movement, ‘The Tramp, the Parasitic Hymenopter and its Larva’, takes its cue from the opera’s only human character, a drunk vagrant who anthropomorphises the insects he encounters. Investing them with human feelings and foibles is not as twee or Disneyfied as it may seem; indeed, Aho provides music of considerable wit and character here. 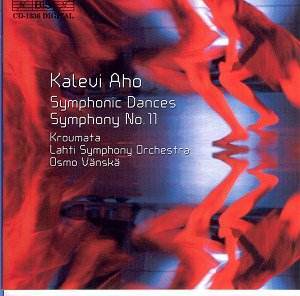 The tipsy brass and bass-drum pratfalls of the first movement are nicely done, and despite the episodic nature of this work Aho manages to weld the sections into a fairly convincing symphonic whole. There is music of real virtuosity throughout that calls for contributions from solo piccolo, flute, trumpet, tuba and cello. Naturally, the deliciously louche ‘Foxtrot and Tango of the Butterflies’ demands an alto sax, stylishly played by Hannu Lehtonen. It’s infectious stuff, the rhythms as sharp as a razor. The tango especially has a sultry charm that is most enjoyable, the players clearly relishing the chance to let their hair down a little. The somewhat ungainly sounds of the next movement manage to suggest the squat shape of the hard-working dung beetles. I suppose one could argue that this is the kind of workaday accompaniment one might expect from an Attenborough documentary but really you’ll find nothing there that is as accomplished as this. You won’t hear crude musical imitation in ‘The Grasshoppers’ either; even though there is an appropriate chirpiness to the writing here. The martial rhythms of the working ants are subtly done, with fine contributions from the Lahti brass and percussionists. It’s strong, muscular music that never breaks its stride, the sheer range of Aho’s colour palette very impressive indeed. And there’s a satirical edge to these marches that Shostakovich would surely have enjoyed. Just listen to the gong’s long, slow decay into silence at the end of this movement, a simple device but hair-raising nonetheless. Aho is in a much more reflective mood when it comes to the short-lived dayflies. Is there a philosophical dimension to this movement? Perhaps; the music certainly has a fleeting, evanescent quality that is most apt. Aho’s melodic strengths are very much in evidence here, the music unfurling like the passing hours. It’s not all wistfulness – there are some splendid climaxes too – but the symphony does draw to a gentle, reflective close. Aho provides music of great tenderness and beauty here, an extended lament, moving in its simplicity. Even though the composer can’t quite disguise the ‘bitty’ nature of this score – one could argue that it’s more of a suite than a symphony – it is bound together by music of great originality and charm. Kudos to all involved, especially the BIS engineers, who have produced another astounding disc. Not to be missed. If Aho uses fugues to forge a link between his music and that of earlier periods he does the same with this symphony, subtitled ‘Sinfonia Concertante’. A classical conceit – Mozart’s K.364 is probably the best known example – this admixture of concerto and symphony has persisted through the 19th century and into the 20th. Latter proponents of the genre include Prokofiev, Martinů and Walton. In his liner-notes Aho admits the Third Symphony was intended as a violin concerto but it metamorphosed into a sinfonia concertante, the first movement of which – a darkly expressive Andante – is dominated by the soloist. But it’s the muted timps that make the most impact at the outset, surely reminiscent of the start of Shostakovich’s bleak Symphony No. 11, ‘The Year 1905’. That said the violin rises out of the mists in a songful display. The Finnish violinist, Jaakko Kuusisto, fends off the encroaching orchestra with some lovely, understated playing. The distinctly martial mood of the Prestissimo doesn’t drown out the soloist completely, although there are some impressive drum thwacks here. Sensibly the BIS engineers haven’t gone for a hifi spectacular, but have produced a recording of considerable range and sonic impact. As always, though, it is the astonishing detail of Aho’s score that registers most clearly. The Lahti band play very well indeed – just listen to the superbly articulated brass at 6:23, baying first and snarling later. Throughout Vänskä manages a good balance between momentum and weight on the one hand and detail and colour on the other. The movement ends with a long, breathtaking crescendo for snare and bass drums. The Lento may seem like an oasis of calm after the turbulence of the previous movement but there is still a restlessness, a sense of disquiet. It’s not the highly strung – some might say histrionic – anxiety one associates with Shostakovich; no, it’s altogether more controlled, stoic even, with an implacable tread that’s surely more Sibelius than Shostakovich. However, the bells at 7:03 bring to mind the tocsins (alarm bells) of ‘The Year 1905’. Once again Aho – still in his early 20s at the time – surprises with music of astonishing eloquence and beauty, as in the lovely string passage that begins at 7: 28. The fourth movement – marked Presto – reprises the muted opening of the first movement, the soloist dissembling briefly before the menacing martial rhythms return. Ensemble is crisp and clear throughout, the Sibelius Hall providing just enough warmth without clouding all-important details. It really is an exemplary recording and proof, if it were needed, that good production values can significantly enhance one’s enjoyment of music, especially when it comes to new and unfamiliar repertoire. The filler is Aho’s arrangement and orchestration of Mussorgsky’s Songs and Dances of Death (1875-77). Of course Mussorgsky is no stranger to such things – witness Rimsky’s ‘version’ of Boris Godunov and no less than 28 orchestrations of Pictures at an Exhibition – and this song cycle is no exception. Rimsky and Glazunov prepared an orchestral score from the piano original but the dark intensity of these death-obsessed songs is best realised in Shostakovich’s 1962 reworking of the score. The baritone Dmitri Hvorostovsky recorded the latter version with Yuri Temirkanov and the St. Petersburg Philharmonic (Warner Classics 2564 62050-2), which I have used for comparison. 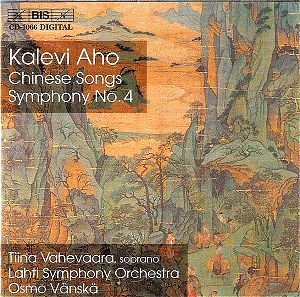 Arguably his voice is not quite dark enough for these songs – Aho’s version was written in response to a request from the formidable Finnish bass Martti Talvela – but it’s the orchestration that is of real interest here. In the CD booklet Aho says he strived to preserve the work’s character while enhancing it with what he calls ‘psychological instrumentation’. An interesting strategy, risky even, but does it work? These four songs deal with a mother’s desperate attempts to protect her child, Death’s flirtation with a pale young woman, a drunken tramp collapsing in the snow and Death summoning his armies on the battlefield. Shostakovich’s response to ‘Cradle Song’ is unmistakable, from the winding cello theme at the outset to those bell-like sounds that seem to mark the passing hours. It’s surprisingly austere, Aho’s version perhaps more overt – theatrical even – with greater dynamic and emotional contrasts. That said Shostakovich’s arrangement has a marrow-piercing chill that is hard to beat. Death’s ‘Serenade’ isn’t as erotically charged as it might be in Aho’s version but then I wasn’t particularly convinced by Matti Salminen’s vocal characterisation either. In comparison Hvorostovky has an arrogance, a virility, that is much more appropriate to this cruel seduction. Orchestrally Shostakovich pares the music down to its essentials, not a note, rhythm or nuance wasted. Just listen to Death’s triumphant cry at the end, underpinned by a simple timp stroke; Aho opts for a swirling harp and mighty drum thwack, which is much less subtle. In ‘Trepak’ Salminen – who is never less than polished, if sometimes a little bland – sings with vigour and intelligence. He is suitably taunting here, Aho’s orchestration exotic and larger in scale than Shostakovich’s. But, and it’s a big but, it’s the latter’s biting, more sardonic scoring that is most telling here. Similarly Shostakovich’s Field Marshal is vocally more communicative, the grim, bell-like orchestral figures tolling to great effect. At the start Aho’s powerful drums are exciting but again one feels that in this case less really is more. As a virtuoso vocal and orchestral display this piece certainly has its merits but if you want to get to the dark heart of these songs Shostakovich knows the way. A mildly disappointing disc, on account of the Mussorgsky, but the symphony certainly confirms Aho’s growing confidence in the genre. Other influences may still be discernible but they are gradually being supplanted by music that is distinctively his own. One of the characteristics of these symphonies that I particularly relish is his ability to surprise and seduce when one least expects it. As always, Vänskä and his Lahti band are in fine fettle, the recording a model of clarity and warmth. Not perhaps the finest disc in the cycle but well worth exploring nonetheless. Mahler’s Chinese settings in Das Lied von der Erde spring to mind here, Anne Weller noting that Aho chose his texts for their ‘joie de vivre ... combined with the transitory nature of life’. Mahler would certainly understand these sentiments and, yes, there is a hint of late-Romantic weltschmerz here too. Aho deftly blends the scented imagery of these poems with music of economy and restraint. Yet there is a charge, a tension, in this song that Vahevaara captures rather well with her transported singing. In ‘The Golden Bird Hairpin’ we are made keenly aware of the passing of time – ‘At the moment of night the water clock stops’ – and the mood continues to darken in ‘At Night, Very Drunk’. There is a marvellous, tremulous quality to the orchestral writing here, a heightened sensitivity to the song’s mood of growing despair. In the final pairing, ‘The Wind of Autumn’ and ‘In the Snow, the Message of Spring’, Aho adds a certain chill to the first with music that swirls around and lifts the vocal line; the final song opens with a bright, tolling figure, this time amidst a flurry of snow. At last the intervention of a benign deity brings new-found joy – ‘Now we drink wine from deep golden goblets!’ – and Aho responds with music of some vigour and weight. It’s not the most grateful of parts – more a kind of oriental vocalise – but Vahevaara acquits herself well in the work’s more ecstatic moments. We now step back a quarter century to Symphony No. 4 (1972-73). Fennica Gehrman, whose FIMIC essay I referred to in my introduction, believes this symphony marks the end of Aho’s so-called ‘early period’. Indeed, even a cursory audition of this score suggests a shift in the composer’s musical landscape. Not seismic, perhaps, but significant nonetheless. Begun while the composer was on a scholarship to Berlin, the Fourth Symphony was only completed on his return to Finland in 1973. Not surprisingly it has a fugal theme in the first movement that resonates throughout. The gentle opening of the Adagio sounds wonderfully poised and translucent, before descending via the lower strings to a less idyllic plane. There is a palpable tension here, the sudden brass fanfare at 4:14 echoed shortly afterwards, before the timps confirm this growing sense of unease. As always with this composer there is a remarkable compactness, a simplicity of design, that is lyrical and heartfelt. More important there is a cumulative energy in this Adagio, a thrust and intensity, that we’ve not heard before. Yes, the transported trumpets may remind you of Shostakovich, but it’s the melancholy string theme at 10:00 that is most striking, the long, expressive lines very moving indeed. The original fugal theme is continually tossed about in this lengthy movement, yet the music doesn’t outstay its welcome. Vänskä is particularly adept at maintaining tension throughout, never allowing the players to lose focus or momentum. Typically the Adagio ends with one of Aho’s lovely string melodies, fading slowly into silence. Very atmospheric indeed. The excitable Allegro – Presto is chockful of ear-pricking detail, the playing wonderfully supple and precise. It really is remarkable how the composer deploys that germinal theme in such original ways. And at 4:45, surely that busy little theme brings Prokofiev to mind? Certainly there is a motoric element to this music that the latter would have recognised. There is a real frisson of excitement at the long, pounding peroration that ends this movement. Goodness, this is terrific music making, crowned with some visceral – and well recorded cymbal clashes. The half-lit Lento is altogether different. There is a dirge-like quality at the outset that steers well clear of lugubriousness. Once again I had to admire the composer’s melodic and harmonic gifts, not to mention his ability to shift the mood so seamlessly. Listen to that circus-like fanfare at 8:07. In other hands it may seem incongruous but in Aho’s it sound entirely apposite. And that, surely, is the sign of a composer firmly in control of his material. An exhilarating symphony this, and another triumph for Vänskä, his players and the BIS engineers. Even in an age of high-resoution recordings this must count as one of the finest recordings in the cycle. The Chinese Songs are a desirable filler, but as with the Songs and Dances of Death I remain somewhat ambivalent about Aho in vocal mode. But the symphony’s the real draw here, and that I can heartily recommend. At the time of writing (September 2008) neither of these symphonies has appeared on BIS. In the case of the Sixth, there don’t appear to be any commercial recordings at all. However, there is a fine version of the Fifth – coupled with the ‘Insect Symphony’ – from Max Pommer and the Leipzig radio orchestra (Ondine ODE 765). Read my colleague Tim Perry’s enthusiastic review here. 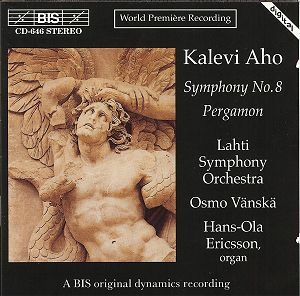 This work, one of many commissions from the Lahti Symphony Orchestra, is Aho’s very own ‘Organ’ Symphony. A densely packed piece in eight movements it’s also rougher and more angular than the earlier symphonies, with great cliffs of sound alternating with quieter, more intimate moments that recall his earlier works. ‘The tragedy of society and the individual, and its musical setting’, the title of Anne Weller’s booklet essay, gives one an idea of what to expect from this music. And although the Eighth marks a somewhat traditional journey from innocence to experience, what is less traditional is Aho’s musical language, which is much more uncompromising than before. Dissonances are plentiful, the organist playing a series of cadenzas in the three interludes, while adding colour and weight elsewhere. For once I couldn’t think of a comparable sound world, such is the individuality of Aho’s writing here. The opening of the Introduction starts at both frequency extremes; it’s a strange effect and the first of many in this work. The first somewhat manic Scherzo displays a growing tension that erupts in a series of confrontations between organ and orchestra. Aho intersperses these conflicts with quietly rhythmic – yet restless – episodes. It’s curiously unsettling music, exacerbated by the organ’s virtuoso display in the first Interlude and the strident dissonance that opens the second Scherzo. There is still plenty of instrumental detail audible but nothing prepares you for the epic battle that begins at 3:26. Remarkably Vänskä keeps his forces on track and the engineers never allow the music to slide into incoherence. This is demonstration material that will surely tax even the best sound systems. Aho knits these movements together with considerable skill, so that the bells and organ at the end of the second Scherzo act as an effective ‘bridge’ between it and the ensuing Interlude. Ditto the transition from this Interlude to the ferocious music of the third Scherzo. If it’s spectacle you want just listen to the passage that begins at 7:46 in this third and last Scherzo; it’s a shattering stand-off between organ and timps, fading to a simple yet reassuring Interlude. (And yes, there’s another one of those near miraculous transitions here too.) Indeed, there is a hypnotic calm here – a sense of spirituality, perhaps – that may well remind listeners of Messiaen at his most contemplative. Organist Hans-Ola Ericsson plays with great sensitivity throughout and in the Epilogue the low-frequency rumble of the instrument as it underpins the orchestra is superbly balanced by the BIS engineers. Now the agitated timps are supplanted by gentle beats below organ glissandi, the battle hard fought and hard won. It’s this unfailing ability to ambush his listeners that makes Aho’s scores so fascinating. Pergamon, written for the 350th anniversary of Helsinki University in 1990, is based on the so-called Pergamon Altar that dates from the 2nd century BC. It’s an extraordinary edifice, with a 371ft frieze depicting the battle between the gods (in human form) and the giants (fallen angels). (Photo courtesy of G. Ray Thompson Salisbury University click for enlarged version) This gigantomachy, reconstructed in Berlin’s Pergamon Museum, gives Aho plenty of scope for thrilling orchestral effects, starting with that massive gong and drum smash and ensuing organ pedal. But there’s more to this piece than simple sonics. The texts, by the German writer Peter Weiss (1916-82), who fled Nazi Germany and settled in Sweden, are spoken in German, Finnish, Swedish and Ancient Greek. The four narrators are arranged around the auditorium, their declamations swirling about the hall. Clearly Aho is fascinated by spatial music, an interest that culminates in his ‘Luosto’ Symphony, premiered on a mountainside. Given Weiss’s antipathy to the Nazis his response to this great battle has obvious resonances. For his part Aho creates a most unusual work, the voices sandwiched between music that roars and shrieks at both frequency extremes. In between there is much to delight the ear; just listen to that strange glissando that begins at around 3:12. Even though this is one work that needs to be heard live the BIS engineers have done a remarkable job capturing the essence of this ambitious score. As ever the Lahti band play with great concentration and produce some spine-tingling sounds along the way. And while the piece has its apocalyptic moments – sample the passage beginning at 7:16 – the composer’s judicious use of orchestral effects ensures Pergamon never becomes bombastic or vulgar. A terrific filler and a splendid piece in its own right. Altogether a very successful coupling. Hard on the heels of the Eighth comes another hybrid – Aho originally called this work Sinfonia concertante No. 2 – with the trombonist flamboyantly adding his distinctive timbre to the orchestral mix and giving voice to the work’s inner tensions. In her liner-notes Anne Weller points out that the Eighth and Ninth symphonies – paired at the latter’s premiere – are musical opposites, one dark the other light. A quick run-through of the Ninth rather confirms this, with Christian Lindberg’s mellifluous entry in the first movement quite without angst or aggression. Even the animated orchestration suggests an altogether more optimistic mood. In fact just listen to the passage that begins at 2:44, a lightly sprung piece of baroquerie with some beautifully articulated playing from the soloist. 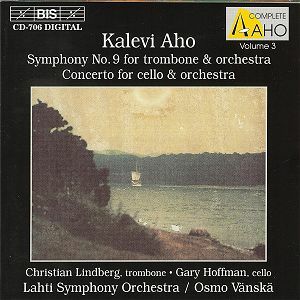 As I mentioned in my review of the First Symphony Aho seems to see himself as part of a great musical tradition; the Ninth is no exception, combining contemporary sonorities and melodic juxtapositions with formal elements from the past. Aho manages this very well, the various elements blended with great naturalness and skill. Far from seeming an odd progression the first movement, Presto, presents us with an invigorating musical collage, passages of Beethovenian thrust and energy jostling with late 20th century timbres and dissonances. It’s a heady mix but Vänskä, Lindberg and the Lahti band despatch it with great virtuosity. Even the three mighty drum thwacks at the end of the first movement can’t dispel the music’s more genial mood, especially in the Adagio that follows. Lindberg’s playing here is very impressive indeed, the elegiac trombone rising over a grumbling bass. Another one of Aho’s rather magical slow movements, but it’s not without music of a more uncompromising nature. Yes, taken at face value this may be a sunnier piece but there is still an inner dialectic here – witness the collision of trombone and orchestra. And at 8:19 you may be forgiven for thinking you were listening to a sackbut as the music slides seamlessly into late Renaissance/early Baroque mode. The most ebullient music belongs to the third movement, whose opening Presto has real sparkle and sprightliness. As always Lindberg’s virtuosic playing is first-rate, in what seems to be a good-natured tussle with the drum-dominated orchestra. No existential angst here, just writing of great skill. For a bit of fun just listen to the tipsy trombone passage that begins at 3:37. This is music written – and played – with plenty of humour. Vänskä brings it all to a triumphant close. By contrast the Cello Concerto is a much spikier, more unforgiving work. That’s clear from the cello’s opening melody and the orchestra’s dark, sustained dissonances. Glissandos abound in the orchestra, creating a remarkable sense of ‘otherness’, with only the ghostliest of rhythms emerging at 2:50 in the first movement. The cellist, Canadian-born Gary Hoffman, is convincingly recorded, combining warmth with detail. There is a Godot-like sense of alienation in this oblique ‘dialogue’ between soloist and orchestra, with a slow-burning but increasingly powerful passage that begins at 4:18. That said the music takes on a rollicking gait as well, this flash of humour soon subsumed by the weightiest of perorations. The first movement ends with an extended, more reflective passage for the soloist before evaporating with a gentle shimmer. There is nothing enigmatic about the powerful, stabbing rhythms that launch the second movement. This is writing of great power and concentration, a foil to the extended – and virtuosic – solo cadenza that follows. In the end, though, it is the orchestra that triumphs with a roof-raising climactic passage that begins at 11:03. Once again I could only marvel at the depth and scale of this recording, it really is astonishing. But there is always a surprise in store and rather than end with a bang the concerto ends with a whimper, fading out just as the first movement faded in. Not an easy listen, this. One may flinch at the wide dynamic range of Aho’s score but there’s no doubt the composer has absolute control of his material. Vänskä also knows where this music is going and delivers what must surely be a benchmark reading of this wild and wonderful work. Aho’s opera Insect Life may have been rejected at first but that didn’t stop him dabbling in the genre. Rejoicing of the Deep Waters is based on his opera, Before We All Have Drowned, which has since been performed in Helsinki and Lūbeck. And even though it was written for the city of Lahti’s 90th anniversary it’s certainly not celebratory in tone. In fact the work begins with a lovelorn surgical nurse throwing herself off a bridge, the ensuing story told in a series of flashbacks. There is certainly a dramatic thrust to this score, yet it is framed in a surprisingly conventional musical idiom. And despite the seemingly grim plot there is little Nordic angst on show here, confirmed by the music’s almost classical restraint and sense of proportion. Indeed, it’s just like a conventional overture, with a discernible dramatic ‘arch’, and if it has a message it’s in the final words of the opera: ‘Listen, so that you learn to listen / and save us / before we are all drowned.’ It makes an attractive, if lightweight, curtain raiser to the more substantial symphony that follows. 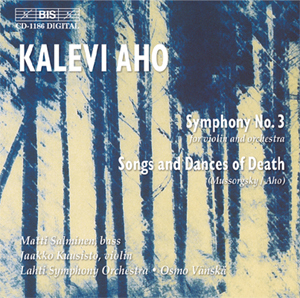 Speaking of classical structures, Aho’s Tenth Symphony – a joint commission from the Lahti Symphony Orchestra and the Finnish Association for Mental Health – has its origins in a performance Aho heard of Mozart’s Symphony No. 39, played by the Lahti band. An intriguing source of inspiration, perhaps, but not one that readily comes to mind when listening to this towering score. Admittedly, as Anne Weller points out in her liner-notes, Aho only uses the first three notes of the Mozart symphony’s main theme to launch his Tenth Symphony. The Allegro certainly starts off with some delicacy and charm but it’s soon clear this is not going to be a sunny work. The ever-present timps rumble like distant thunder as we move into a darker, gong-tormented world and back into another, more elegant, lightly sprung phase. Throughout there is an admirable clarity and lightness of step that is most appealing. As always Aho is a master of unusual contrasts and unexpected timbres. The extra resources required – among them soprano and alto trombones and a piccolo clarinet – give you some idea of the work’s colour palette. The Prestissimo has some fevered string playing against a rather ghostly background. It’s unsettled – and unsettling – with a macabre rattling figure underlining it all. Macabre would certainly be one way of describing the mood of this movement, whose timps and-tam tam rear up from time to time. It’s not nearly as uncompromising as it sounds. Indeed, out of the turmoil arises a luminous little melody that takes us to the end of the Prestissimo and segues neatly with the yearning string theme that begins the 20-minute Adagio. This is music of great intensity, not a million miles from the innig Adagios we associate with Mahler. Not only that, there is a wonderful transparency to the writing here that also reminds me of Mahler, albeit with Aho’s own imaginative touches. Don’t expect angst, for this Adagio is shot through with passages of great poise and tenderness. 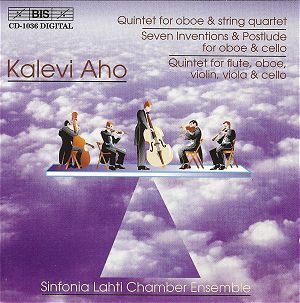 Extraordinarily, Aho binds these disparate sound worlds into a very convincing whole, the hushed playing of the Lahti band riveting throughout. And the peroration that begins to build at 8:42 has an unmistakable, echt-Mahlerian feel, matching weight with detail. 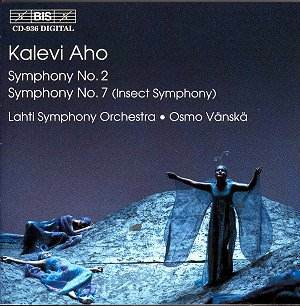 Most importantly this symphony never postures or lapses into empty rhetoric; indeed, Aho’s unfailing directness and drive are what make this music so invigorating. Yes, there is a series of cataclysms – shrieking clarinets and timps – yet Aho does ‘modulate out of the key of self-abasement – to borrow Forster’s phrase – into something more stoic, noble even. And what an extraordinary climax to this movement, a long fade to silence, followed by a quirky, virtuosic Vivacissimo. Again I was struck by the natural perspectives and balances in this recording. It’s the sound one might hear from a good seat in the stalls. Longueurs? Vänskä makes sure there aren’t any. And just when you think the end is in sight Aho throws in another eruptive passage that carries the symphony to its powerful close. Stirring stuff, adroitly done. The Symphonic Dances are derived from Pyörteitä (Whirls) an unfinished ballet by Uuno Klami (1900-61). In his detailed liner-notes Aho explains that he orchestrated the first and second acts (available on BIS CD 656) and was then asked to write the music for the missing Act III. However, plans for the ballet came to nought, so Aho retitled the work for concert performance. Pyörteitä is based on part of that epic of Finnish and Karelian folklore, the Kalevala, which inspired no less than 12 works by Sibelius. Klami’s ballet focuses on the forging of the Sampo, which Aho describes as a ‘magical object that brings eternal happiness and prosperity’. In the first act Ilmarinen the smith can’t quite make the genuine article, no matter how much his slaves stoke the furnace. Act II, set in space, features a number of astral dances, and in the climactic third act Ilmarinen and his minions harness the power of the winds and finally create the Sampo. Powerful stuff and a marvellous opportunity for Aho to let rip. Indeed, my review copy of this disc was plastered with stickers extolling its sonic virtues. The Prelude opens with bells and swirling harps, before slipping into music of real vigour and bite. Listeners may be reminded of other ballets – Stravinsky’s Firebird and Prokofiev’s Ala and Lolli perhaps – but as always Aho gives this music a distinctive flavour of its own. As for the recording, it certainly lives up to the promotional hype. There is detail aplenty and the climaxes expand without a hint of strain. I was particularly impressed by the depth of the soundstage, which creates a more ‘layered’ sound, allowing one to hear inner detail. It’s certainly motoric – sample the passage beginning at 1:37 – but this exhilarating score manages to combine fluidity with power. It really is music that cries out to be danced to. The ‘Grotesque Dance’ brings together lurid sounds – listen to those brass whoops at 4:09 – and moments of surprising tenderness before the orchestral gales begin to blow in the ‘Dance of the Winds and Fires’. Once again I was struck by the sheer inventiveness of this score, which has plenty to please the ear and set the pulse racing. Special thanks to the musicians and conductor, who inject just enough adrenaline into a score that could so easily sound overblown. And just in case you think it’s all too driven listen to this lovely postlude that begins at 11:30. Simply gorgeous. Originally a commission from the Swedish Concert Institute the Eleventh Symphony was to include the Kroumata Percussion Ensemble. Anyone who has sampled the latter’s discs will know they are an exceptional band. As Aho relates in his liner-notes he took the time to visit them during the compositional process. The work was premiered by the Lahti orchestra on 10th March 2000, as part of the inauguration of their new Sibelius Hall. The orchestra is slimmed down and the six percussionists provide a marvellous range of sonorities and rhythms throughout. The first movement – Untitled – is also strangely unformed at the outset, with the quietest of introductions emerging from the primordial silence. It’s another of those captivating moments one has come to expect from this composer, the spacious acoustic allowing the music to bloom and grow with ease. Even with a reduced orchestra Aho manages some powerful percussive climaxes but that theatricality is tempered by a commendable economy of style. The emerging rhythms take some time to establish themselves but when they do they come across with tautness and precision. The music then slips seamlessly into a gentle Andante. The heckelphone is soon supplanted by vital, thrusting rhythms one usually associates with Bernstein in Broadway mode. As for the Kroumata ensemble they are a class act, their competing rhythms very well articulated and recorded. Sample the passage that begins at 8:44 and you’ll get some idea of the extraordinary virtuosity of these players. The final movement – Tranquillo – harks back to the quiet opening of the symphony. More than that, it looks forward to the Twelfth Symphony in its use of space. Here the percussionists are arrayed around the hall, the distinctive sound of the 10-stringed kanteles – traditional zither-like instruments – adding to the disembodied swirl of this movement. In a theatrical flourish reminiscent of Haydn’s ‘Farewell’ Symphony Aho directs the percussionists to leave the hall, playing ancient cymbals as they go. Granted, a multi-channel recording would probably capture the shifting aural perspectives more effectively – as indeed it does in the Twelfth Symphony – but it’s still a wonderful sign-off. Just as the finale of Aho’s Eleventh Symphony owes something to Haydn the Twelfth draws on an earlier tradition of outdoor music. The most familiar examples of this are Handel’s Music for the Royal Fireworks – itself the model for Sir Malcolm Arnold’s Water Music, Op. 82 – and Haydn’s Feldparthien, but rather than a barge or castle grounds Aho chose to set his work on a mountainside. The CD booklet has a fascinating photograph of the premiere (click to enlarge), also conducted by John Storgårds, on the wooded slopes of Mount Luosto, in Finnish Lapland. The BIS recording was made in the now familiar Sibelius Hall, with the large orchestra and chamber forces placed on opposite sides of the auditorium. The latter are joined by the saxophone and soprano soloist, with various brass and percussion instruments arranged around the periphery. Of course it’s only an approximation of the open-air version, which must have been extraordinary, but this multi-channel SACD does offer the listener a genuine ‘surround-sound’ experience. The two-channel stereo layer gives you a fair idea of the spatial nature of this symphony, but this is one work that really demands a multi-channel system to maximise the effect. It’s powerful, visceral music laced with moments of genuine beauty and sweep, as in the passage that begins at 3:13. There is grandeur, too, as befits the mountain setting, the two bands playing with enormous energy – listen to that crescendo at 7:20. The use of rain sticks and other exotic instruments make for an exotic and overwhelming musical experience. There is much more to this symphony than brute force – as the eloquent close of ‘The Shamans’ confirms – and in the second movement we pass into a world of contrasts, winter night and summer light. In the first half eerie brass echo, as if in a void – Haydn’s ohne Form und leer, perhaps – and a blazing es ward licht as the sun appears at 4:10. What follows is music of haunting beauty, superbly played and recorded. By whatever yardstick one might choose this is a composer at the height of his powers – confident, forthright, original – and the closing pages of this movement are as memorable and moving as anything one might expect from Sibelius or any of the great symphonists. The wordless vocalises of the tenor and soprano soloists dominate ‘Song in the Fells’, a celebration of the open spaces painted in glowing orchestral colours. As pastoral music goes there is nothing hackneyed here, thanks to Aho’s seemingly inexhaustible palette. But even in this idyllic setting there is some discord – a hint of the coming storm at 4:56 – and I imagine many listeners will think of Berlioz’s ‘Scene aux champs’ at this point. Needless to say the soloists both sing with great ardour, their voices carrying across the wide open spaces. ‘Storm on the Fells’ must have made quite an impact on the mountainside with its distant rumbles of thunder. Richard Strauss’s Alpine drenching is something of a benchmark in ‘storm music’ but Aho’s is a more subtle affair, built over a longer span and with tension building superbly along the way. He also uses wind machines, the singers all but drowned out by the ferocious weather. And at 4:29 there is another of those frisson-making drum-led crescendos before the thundering orchestra and cracks of lightning give even Herr Strauss a run for his money. In the Alpine Symphony the music that follows the storm is the most lovely; and so it is here, beginning at 7:34. The soloists return and there is a real sense of renewal and optimism as the work draws to a quiet but radiant close. Andrew Litton isn’t a conductor I readily associate with contemporary music so I was curious to hear what he’d make of this oddball concerto for contrabassoon. As for the tuba concerto, yes, there are others – by Ralph Vaughan Williams and a number of contemporary composers – but I’m not aware of any written for contrabassoon. In any event Aho made a point of familiarising himself with this duo’s strengths and weaknesses before putting pen to paper. 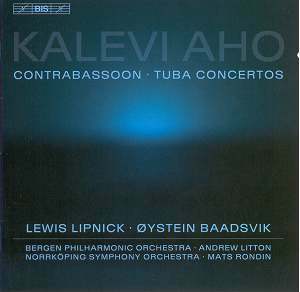 The Norwegian tubist Øystein Baadsvik is an obvious choice for this recording, given that he has premiered some 40 works for the instrument. In his liner-notes the composer speaks of the tuba’s ‘songful’ qualities and that’s certainly borne out by the first entry in the Andante. Aho tends to focus on the tuba’s more liquid middle register here, but the instrument’s rasp and bray is unmistakable in the passage that begins at 3:49. That said, Baadsvik plays with great accuracy, whatever the composer’s demands, and he is given an excellent recording to boot. Mats Rondin and the Norrköping orchestra are both new to me and as good as they sound I longed for the Lahti band’s authority and special brand of magic in this music. I certainly can’t fault the orchestra’s virtuosity in the Allegro, even if they do sound a little undernourished at times. No such qualms about the soloist, who is nothing short of heroic – sample the passage beginning at 3:50 – producing some glorious sounds along the way. The pizzicato strings that open the Larghetto are well caught, the tuba’s first quiet entry astonishingly secure. I was reminded that this gruff, vaguely comical instrument can actually play cantabile, a quality the composer seems to encourage here. Listen to the passage at 7:00 and you’ll hear some of the strangest and most original noises you’re ever likely to hear from a tuba. Not since the Tetraphonics disc of saxophone pieces have I heard the sound of a brass instrument so artfully exploited. A thoroughly enjoyable concerto, superbly played and recorded. By the end any small misgivings I may have had about this band – and indeed this concerto – simply evaporated. Well worth hearing and certainly deserving of a place in the concert hall. The traditional contrabassoon has a number of weaknesses, many of which were addressed by the Fox instrument released in 2001. Designed by the New York Philharmonic’s Arlen Fast the new system of octave keys improved the instrument’s upper reach and tackled issues of poor articulation and uneven tone. According to the instrumentarium in the CD booklet – a useful touch – the concerto’s dedicatee, Lewis Lipnick, uses one of these improved instruments. Lipnick and the Bergen Philharmonic gave the first performances on 23rd and 24th February 2006, which form the basis of this live recording. From the brooding start of the first movement – marked Mesto (sadly) – it’s clear the new system results in a cleaner, more secure sound, even in its mournful lower registers. Aho claims this is one of his most 'monumental’ concertos and it certainly grows to an imposing climax in the first movement. Litton builds the tension very well indeed and the orchestra sound suitably rich and sonorous. From 6:40 onwards one hears just how lyrical this new instrument can sound; very beguiling indeed. And there is no problem with articulation or volume either, as it’s perfectly capable of holding its own in percussive company. This is an imaginative and varied piece, with some outstanding playing from all quarters. Litton, who doesn’t always strike me as the most charismatic of conductors, certainly has the measure of this work, especially the contrasts of the trenchant second movement. And just listen to Lipnick’s low notes at 3:14; very impressive indeed. The final movement, Misterioso, which sounds like a lament at times, reminds me a little of Shostakovich. Here, more than anywhere else this work sounds less like a concerto, the orchestra underpinning and complementing the soloist. The ending is muted, resigned even, the soloist fading to silence. There is no applause – indeed it’s hard to believe there is an audience there at all. The BIS team have done a very good job of conveying the special feel of a live performance without compromising on sound quality. There’s certainly no sign of the slightly ‘dead’ acoustic one often gets with a hall full of concertgoers. A very desirable disc that increases one’s admiration for these under-rated instruments and their players. 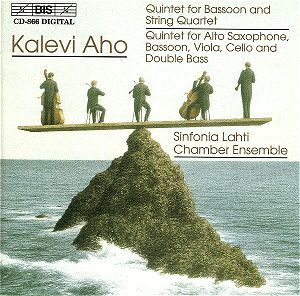 We go right back to the beginning of Aho’s musical career with the first quintet on this disc, composed in 1973. In his booklet notes Aho confesses his love for the oboe; as with the tuba in the Tuba Concerto, he took the trouble to familiarise himself with the oboe's capabilities, the idea being to ‘extend the instrument’s expressive range’. The first of the two movements opens with a bright, songful introduction on the oboe, soon underpinned by the warm strings. As with the orchestral works there is a remarkable clarity to the writing and a real sense of musical purpose. Even in the extended and more animated passages there is a lively dialogue between oboe and strings, at times building to moments of great intensity. Fortunately the engineers have found a good recording balance, so the oboe never sounds overbright, even when played in extremis (at 10:18, for example). Which is just as well, as this instrument is the dominant force in this partnership. Just listen to the birdlike figures in the passage beginning at 5:39 and the virtuosic playing that follows. For a composer still at the beginning of his career this is assured, confident stuff. And the strings play with great bite and passion in the exhilarating section that begins at 9:43. The first movement cadenza is even in tone and very clearly articulated, whatever the register. Jukka Hirvikangas is certainly the master of his instrument, and that goes for the nimble rhythms of the second movement – listen to the breathtaking passage that begins at 2:32. There is much to savour here, and although the oboe’s expressive range is tested it’s only in the second movement that the overall mood darkens and the music becomes more inward than extrovert. That said, Aho brings in some wonderfully sensuous, rather Latin, rhythms at 11:18. But the day belongs to the oboist, whose virtuosity is simply astonishing, now ebullient now reflective but always crisp and clear. Seven Inventions is a much later work, derived from one of Aho’s earlier ones, the chamber opera Avain (The Key). The movements, played without a break, show the composer in a more austere, astringent mode, the music pared down to its essentials. Sonorities and colours are also darker and more complex, although Hirvikangas’s bright-toned oboe sings throughout. In the melting fifth movement, marked Andante, he has the field to himself, but in the sixth the mood suddenly changes. Ilkka Pälli’s cello playing is especially dark and intense from here onwards. The final Postlude is one of those classic Aho movements that fades to an enigmatic silence. By contrast the shrill opening bars of the Quintet for Flute, Oboe, Violin, Viola and Cello are altogether more bracing. The composer admits he set out to ‘explore the outer limits of virtuosity in chamber music’, Outi Viitaniemi’s flute adding much to the music’s somewhat febrile character. It has the usual vigour and rhythmic interest we have come to expect from Aho but perhaps there’s more focus on colour and timbre. Certainly he makes great demands on his players – sample the rising passage at 3:54 – and the results are never less than compelling. Indeed, for those who don’t like chamber music in general – and the contemporary variety in particular – this piece has all the colour, drama and thrust one could hope for, without ever becoming incoherent or overbearing. I was impatient for the end, not through boredom but because Aho usually springs some surprises in the final pages. Happily this quintet is no exception; sample 15:00 onwards and you’ll hear music of great originality and flair. This is another welcome release, characterised by a bright, clearly etched recording and playing of great polish. There’s always a fine line between sheer virtuosity and musical substance but the balance here seems just right. Four years after the Quintet for Oboe and String Quartet Aho wrote one to showcase the talents of Juhani Tapaninen, the Finnish Radio orchestra’s solo bassoonist. Like the Seven Inventions it is cast in several movements, played without a break, and it also has a clear, overarching narrative. The Ouvertüre starts comically enough, with instrumental brays and slides, the overall sound bright and clear. The Gershwin-like melody played over pizzicato strings is particularly memorable as is the one at the beginning of ‘Parodie’, the second movement. There is a bluesy languor at this point, but more than that it’s a deft piece of pastiche on Aho’s part. There are some harmonically dense and complex passages here, with pizzicato strings sounding surprisingly vehement, followed by a lighter, freewheeling Scherzo. There is plenty of wit and buoyancy in this music, which demands great precision and unanimity from the Lahti players. This is clearly one of those occasions where one senses the musicians enjoying themselves; just sample the strings’ bracing attack at 4:28. The Cadenza is another of those virtuosic movements that manages to combine bravura playing with a modicum of feeling. Some wonderfully assured playing here, especially from the strings, and bassoonist Harri Ahmas makes the unwieldy lower notes seem surprisingly well rounded and well projected. And what a wistful conclusion, thanks to cellist Ilkka Palli’s generous, warm-hearted playing. The Finale is light and airy, textures admirably clear throughout, the bassoon proving it is more agile than one might expect. And in Epilog Aho moves from a stentorian opening through a kaleidoscope of colours and Morse-like blasts from the bassoon to a quiet, spare close, complete with strangely muted string pizzicatos. The alto sax is in charge of the second quintet on this well-filled disc, its distinctive timbre ringing out from the very start. The instrument doesn’t sound as bluesy as one might expect, more like another colourful thread to be weaved into this musical tapestry. The double bass makes a considerable impact in the first movement, ballast to the high-flying sax – just sample the passage beginning at 3:00 and marvel at Hannu Lehtonen’s transported playing. And what to make of those jaunty rhythms beginning at 8:16 and 8:50? Aho again proves he is adept when it comes to slipping from one mood or mode to another, making it all sound so natural and seamless. The first movement is so packed with incident – after all, it lasts nearly 18 minutes – one might be tempted to think there’s nothing left to say in the remaining two. Not so, although the opening of the Allegro is as insistent as that of the Largo. Aho manages to get so much weight and momentum out of his players at this point that it’s sometimes difficult to believe there are only five instruments in the mix. This is certainly the composer at his motoric best, repetitive yet always gripping. Just listen to that fevered blast on the alto sax at 3:26 – hair-raising. The Andante contains some arresting sounds, from the brooding intro, complete with wailing sax, to the more impenetrable thickets that follow. There is so much material here one might feel a little bewildered, and while the musicians have a firm grip on the music I did find myself wandering towards the end. Perhaps the sheer virtuosity of the piece, remarkable as it is, becomes a little relentless after a while. I imagine most listeners will come to Aho through his orchestral works which, in my view, show this composer at his considerable best. As for the chamber pieces these might well ensnare those who don’t usually warm to the genre, as they have a symphonic weight and logic about them. For those who already know the symphonies they make an interesting appendix to this composer’s other works and, as such, should be included in your collection.